Delainey Patterson made it two in a row at the district golf tournament. 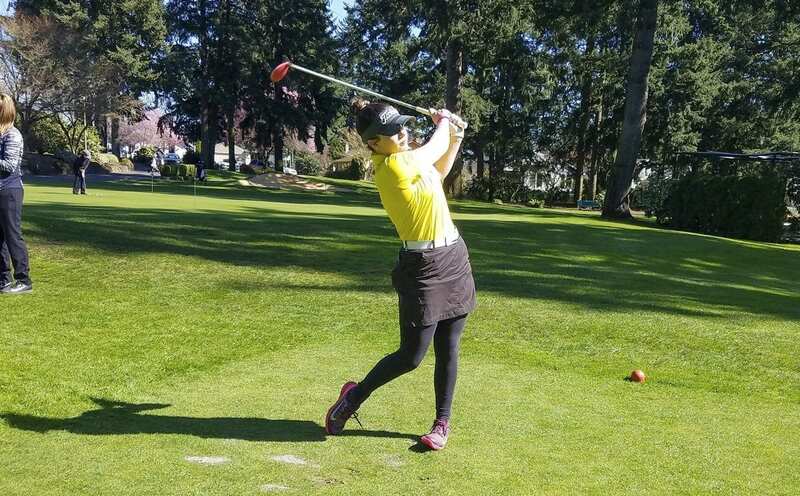 A senior from Prairie, Patterson defended her championship from a year ago at the Class 3A tournament Tuesday at Tri-Mountain Golf Course. Meanwhile, Camas senior Hailey Oster took the 4A title. Prairie and Camas also cruised to team titles. After winning this tournament a year ago, Patterson said she wanted to treat this year like a “cherry on top,” just something extra. She did not want to put too much pressure on herself. She ended up with back-to-back 77s this week to claim back-to-back championships. She won by six strokes over Kelso’s Liz Dolan. Kiana Coburn of Fort Vancouver finished third. Patterson knew she had a big lead so she played it safe in the final round. The top five 3A golfers automatically qualify for state. The next nine go to the bi-district tournament with one more chance to make it to state. Baylee Robertson of Prairie finished fourth and four more Falcons are going to bi-district as Prairie ruled the team race. Camas was even more dominant in the 4A team race. The top-five finishers were all Papermakers. Oster, Abigail Jiang, Ashley Clark and Emma Cox all qualified for state. Lauren Tsukimura took fifth and two other Papermakers are also going to bi-district. Oster, a senior, followed up her first-round 73 with a 79 for a two-day total of 152. That was seven shots better than Jiang. 4A: Union and Heritage played on the same field Tuesday night. They both prevailed in similar fashion, too. Union beat Tahoma 3-2 with a victory in penalty kicks. Heritage topped Kentridge 3-2 after winning in penalty kicks. It was Heritage’s first soccer playoff win in seven years. Union will take on Olympia on Thursday with a berth to state on the line. Heritage will play Sumner on Thursday, also hoping to get to state. Heritage’s match is a loser-out. Union will have two chances to win one match to qualify. 4A GSHL champion Skyview, which had a bye Tuesday, will face Auburn on Thursday in winner-to-state, loser-out match. 3A: Hudson’s Bay takes on Bethel in Lacey at 6 p.m Wednesday in a loser-out match. Mountain View play at noon Saturday and Evergreen will play at 2 p.m. Saturday, both at McKenzie Stadium, in winner-to-state, loser-out matches. 2A: Columbia River and Woodland both qualified for state Tuesday night with victories in the semifinals of the 2A District 4 tournament. The Chieftains rolled past Ridgefield 3-0 and Woodland topped Black Hills 2-1. They will play for the district title Thursday at Kiggins Bowl. Washougal’s season came to an end in the consolation bracket. Ridgefield must win back-to-back matches in the consolation bracket to earn a trip to state. 1A: La Center beat Elma 6-0 in the opening round of the 1A District 4 tournament. The Wildcats will face Hoquiam in the semifinals Thursday. Camas won an elimination game Wednesday, beating Auburn Mountainview 8-3. The Papermakers take on Kentlake at 7 p.m. Wednesday at Heritage Park in Puyallup in another elimination game. Battle Ground’s season came to an end with a 9-2 loss to Sumner. 3A: Prairie will take on Kelso at Lower Columbia College at 6 p.m. Wednesday in a loser-out consolation game. Meanwhile, Mountain View will travel to take on Wilson at Foss High School at 4 p.m. Wednesday in an elimination game. 2A: All three Clark County teams lost in the opening round of the district tournament Tuesday. Hockinson, Columbia River and Ridgefield fell into the consolation bracket and are back in action Wednesday. Only one team in the consolation bracket can qualify for state and a team must win three in a row this week. 1A: King’s Way Christian crushed White Salmon 13-0 in the 1A District 4 semifinals, clinching a trip to state. Damon Casetta-Stubbs struck out 11 in his five-inning one-hitter. He also drove in four runs. The Knights will face Montesano in the district championship game Saturday. La Center lost to Montesano in the other semifinal. The Wildcats dropped into the consolation bracket and will play Hoquiam on Friday. La Center needs to win Friday and again on Saturday to make it to state.